All of our Baby Panda Cubs were hand-painted in amazing detail, taking inspiration from Baby Pandas born in zoos around the world. Our adorable Panda Cubs are either eating their favorite food which is bamboo or napping after eating a ton of bamboo! Each Panda Cub design stands alone or can be combined any of our other designs such as rocks, flowers, and greens. These Panda designs have a lighthearted feel so as to be placed in a child's room, and sophisticated enough to put in an office or living area. Regardless, you are sure to be impressed with the detail of the artwork that went into this design. You can start with a single Panda Cub and add more later, complete an entire wall, or anything in between. Remember Tatouage Transfers can be overlaid so you can add it to any existing mural. 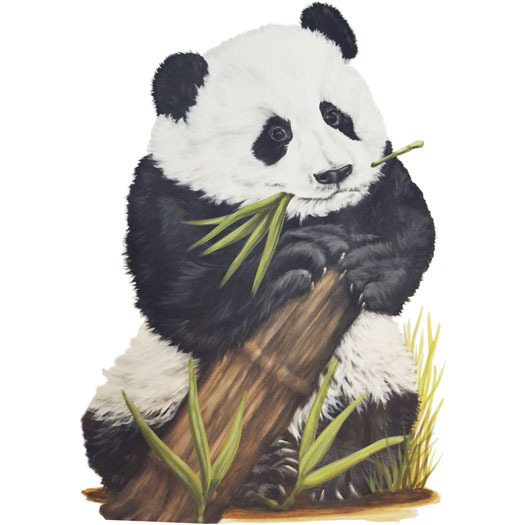 Tatouage is beautiful, durable, cleanable and permanent and has the look and feel of hand painted art..
Ming the Baby Panda Bear measures 2'H X 1'W.